Last week, I shared some preliminary research exploring the narratives and discursive strategies used by opposition MLAs to oppose a minimum-wage increase. This week I’d like to share a preliminary analysis of 17 statements made by the Canadian Federation of Independent Business (CFIB). was not an effective poverty reduction strategy. In the case of Alberta’s massive hike in the minimum wage rate from $10,20 to $15.00 (47 per cent increase) by 2018, this would put 51,700 to 200,690 jobs at risk in Alberta (Wong, 2015a, p. 1). CFIB’s calculations show that minimum wage increases are not the best way to increase low income earners’ well being (Wong, 2015b, p. 2). This assertion sits uneasily with the CFIB’s projections in the same report, which show the net income of workers in every provinces rose with a minimum wage increase. A CFIB survey of 1040 Alberta business owners asked: Which of the following changes has your business already made as Alberta moves to a $15 an hour minimum wage? 55 percent have reduced to eliminated plans to hire new workers, 52 per cent have reduced of eliminated plans to hire young workers, 46 per cent raised prices, 43 per cent reduced overall staffing hours, ad 42 per cent have reduced the number of employees, to name just a few of the implications (Ruddy, 2018, p. 1). Opposition MLAs and the CFIB both used similar narratives about minimum wage increases (e.g., job killer opposed by employers and ineffective at reducing poverty) and similar discursive strategies (theoretical rationalization, cautionary tales). The small number of statements in the dataset suggest that this analysis should be treated with caution. Next week, we’ll conclude this series by looking at organized labour’s contribution to the minimum-wage debate. Next Wednesday (Hallowe’en! ), the Faculty of Humanities and Social Sciences is hosting a half-day symposium (entitled “Frost and Desolation”) as part of broader celebrations of the 200th anniversary of Frankenstein. One of the more interesting interpretations of Frankenstein is as a metaphor for the working class, one created by the bourgeoisie (in the form of Victor Frankenstein) which then tried to kill him. There are a couple of interesting essays about this available online—I like this one by Luisa Umana. 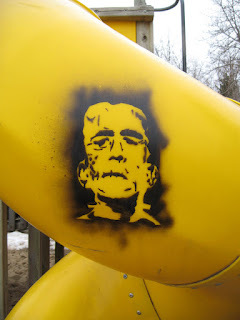 [T]he monster is a symbol for oppressed people. He is the proletariat that revolts against the bourgeoisie in class struggle. … [H]his very composition is symbolic of the laborers who were composed of many different types of people, larger in numbers, physically stronger, and less dependent on luxury than the upper classes. I don’t think that there is much of a historical case Shelley writing with this metaphor in mind. Yet, as perhaps the foundational text of the sci-fi genre, Frankenstein’s framing of collectives as terrifying and monstrous (e.g., the Borg, Cylons, the bugs in Starship Troopers) may help explain the near absence of positive representations of collectives (e.g., trade unions) in the genre. Last week, I shared some preliminary research exploring the narratives and discursive strategies used by government MLAs to justify a minimum-wage increase. This week I’d like to share a preliminary analysis of 115 statements made by various flavours of conservative MLAs in the Legislation. would cause prices to rise, which would harm other vulnerable groups such as seniors and the disabled. Mr. W. Anderson: …Stephen Gordon wrote a piece in Maclean’s [magazine] in 2013 discussing the theory being pushed by big labour that minimum wages hikes mean more jobs. In his survey of the literature, he found that there was no proof of it and that Canada, even more clearly than the U.S., has shown a clear relationship between wage hikes and job losses. In addition, in the survey of the literature, he cites a peer-reviewed 2012 study that finds that, quote, our results highlight that, political rhetoric, notwithstanding, minimum wages are poorly targeted as an anti-poverty device and are, at best an exceedingly blunt instrument for dealing with poverty. (2015.06.24, 263-264). Mr. Kenney: …What do you think a 50 per cent increase in the minimum wage results in? Well, according to the Bank of Canada 60,000 job losses across the country. According to the C.D. Howe Institute 25,000 job losses in Alberta. Think about how – oh, my goodness – when New Democrats get on their moral high horse and pretend they have a monopoly on compassion, and then because union bosses tell them to, they bring in a policy that, according to the think tanks will kill 25,000 jobs for immigrants and youth. Where is the compassion for those who lost their jobs, Mr. Speaker? There is none. There’s no regard. (2018.04.05, 433). There is research both supporting and refuting this assertion, although the balance refutes it. Interestingly, government MLAs made little effort to counter research-based criticism. Instead, government MLAs increasingly focusing on moral evaluation. This may reflect that opposition MLAs cited research that agrees with a commonsensical (albeit not necessarily correct) understanding of wages and employment. Ms. Fitzpatrick: …Now I had a little experience with the chamber of commerce in my community of Lethbridge. When the minimum wage came out, they talked about how much it was going to cost. …The chair of the chamber of commerce told me that it was going to cost $86,000 for this business in one year because of this increase. Okay. So $86,000 is 86,000 hours since there’s a $1 increase…. To get $86,000 you’d need 41 full-time employees working 40 hours a week, and that was not the case. In fact, I got the correct figures and went back to the chamber of commerce, and she said: no, no, no; I think that was over the few years. I said: but you told me it was over one year. (2016,04.20, 688-689). Overall, opposition MLAs relied most heavily on the cautionary-tale strategy, asserting that minimum-wage increases would cause job losses. They also sought to theoretically rationalize opposition by using research to counter government narratives that increases alleviated poverty. Research—by academics and interest groups—were also employed using an impersonal authorization strategy. Looking at both opposition and government discursive strategies, an interesting dynamic emerges. As opposition MLAs increasingly focus on asserting job losses, government MLAs decline to debate this (high-contestable) assertion. Instead, they increasingly focus on the moral argument that increases alleviate poverty and provide dignity and fairness. Opposition MLAs respond by doubling down on research-based arguments—carefully avoiding engaging with the moral argument that government MLAs articulate. Next week, we’ll look at the business lobby’s contribution to the minimum-wage debate. This week’s instalment of Labour & Pop Culture is "Spaceship” by Kayne West. This song explores the frustration and desperation of low-wage work, particularly among young African-American men in the United States. I couldn’t find a good video by Kayne but I did find this blues-y cover that is pretty good. Holla at God Man (every night) why'd you had to take my folks? Alberta’s minimum-wage made its third and final jump to $15 per hour two weeks ago. Over the past few months, I have been examining the narratives and discursive strategies used to advance or oppose the increases by government and opposition MLAs as well by business and labour groups. Over the next few weeks, I’ll be posting some preliminary results—feedback welcomed. would increase the number of jobs by generating additional spending. Government MLAs employed three main discursive strategies (i.e., types of arguments): instrumental rationalization (i.e., ends justify the means), moral evaluation (change advances laudable value), and public authorization (i.e., operationalizing the will of the people). Government MLAs also began attacking opposition’ MLAs when they criticized minimum-wage increases. While instrumental rationalization continued in 2017, it was slowly displaced as the key government discursive strategy by moral evaluation, which moved from the least- to most-used discursive strategy between 2015 and 2018. Moral evaluation legitimized minimum-wage increases by linking them to a specific discourse of values. The main narrative used to morally justify increases centered on how increases helped the most vulnerable Albertans to support their families. This narrative remained stable after 2016 with some expansion of vulnerable Albertans to include persons with disabilities and new Canadians. During this time period, moral evaluation became the main discursive strategy used by government MLAs. The final discursive strategy utilized by government MLAs is public authorization Public authorization is an assertion that one is acting on behalf of a group (in this case, all Albertans). The strong mandate secured by government in the 2015 makes this strategy a natural one for government MLAs to utilize. In the dataset, public authorization was used heavily in 2015, when it was represented 30.6% of the discursive strategies used. Government MLAs referenced the government’s mandate and its efforts to engage with interest groups (e.g., small business) in equal measure. As opponents of minimum-wage increases organized, government MLAs increasingly emphasized public authorization stemming from ongoing consultation with the public and the business community. Ms. Gray: …As we committed to previously, we will be listening to employers and employees on how to move forward with the changes to minimum wage. Focused consultations will be held over the next month with key stakeholders, including employers, social services agencies and the low-income earners themselves. …We want to take the time to listen to the people directly involved while making sure that we are taking care of Alberta families (2016.05.19, 1059). Public authorization continued to be important in 2016, comprising 33.9% of statements. Its use declined in 2017 and 2018. Overall, the clear trend is that, while public authorization and instrumental rationalization were important discursive strategies in 2015 and 2016, over time, moral evaluation became the dominant discursive strategy used by government MLAs. Both instrumental rationalization and moral evaluation employed a narrative that emphasized how raising the minimum wage helped the most vulnerable Albertans to support their families. The instrumental rationalization strategy asserted this as a fact while the moral evaluation strategy asserted it as a desirable value. It is unclear what factor(s) caused this shift in discursive strategy. I suspect that internal government polling identified moral evaluation (or the narratives linked to it) were being well received. Accessing such polling is on my to-do list for this autumn. Next week: The narratives and discursive strategies used by opposition MLAs. This week’s installment of Labour & Pop Culture is “Soup is Good Food” by the Dead Kennedys. This 1985 songs speaks to the disposability of labour in contemporary capitalism. And morale is down, you say? Apologies for the lack of a video—punks don’t go for that MTV stuff. The Vanier Institute recently published an article about the impact of work-related mobility on family life. The study looked at workers who commuted more than an hour a day and workers whose jobs required them to move from place-to-place during the day. Among the findings is that there were significant effects on workers of unpaid idle time (e.g., time spent waiting for work that was not paid). Examples include caregivers who were waiting between client visits or shift workers who must arrive early for a shift due to poor public transportation alignment with their schedules. This time represented a cost transferred from employers to workers (in the form of time stolen from family responsibilities) by the mobile nature of the job. The time pressures that mobility intensifies were also found to negatively affect the well being of workers. Effects included exhaustion, stress, and social isolation. The lack of alignment between non-standard work hours and child-care formed an additional burden that was felt particularly acutely by female workers. From October 10 to 20, Edmonton’s Walterdale Theatre is presenting “The Triangle Factory Fire Project.” This play recreates the events and aftermath of the Triangle Shirtwaist Factory Fire. The New York textile factory was mostly staffed by recent and young female immigrants. When fire broke out on March 25, 1911, the workers found the fire doors and exits locked (to prevent time and product theft). Consequently, 146 workers died from the fire, smoke inhalation, or falling to their deaths to escape the flames. The fire helped propel improvements in building safety across America. On September 28, support staff in Living Waters Catholic School District went on strike. 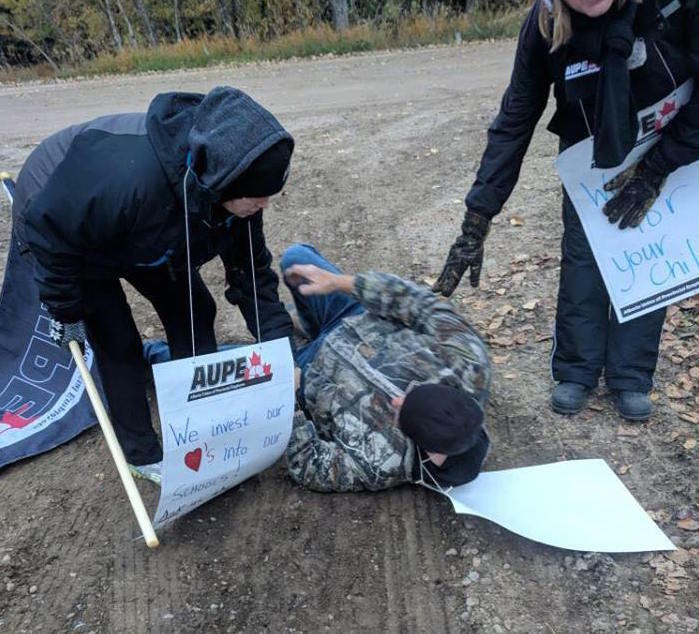 Living Waters and AUPE have been negotiating for two-and-half years and the key sticking points appears to be a wage increase (to cover the cost of living) and having defined hours of work. Living Waters operates schools in Whitecourt, Slave Lake and Edson. Support staff include educational and financial assistants, library clerks, maintenance staff, secretaries, typists and custodians. They are the people who allow the school system to operate. Educational assistants make a maximum of $26,500 per year. This reflects low wages and sporadic (and declining) hours of work. Some workers are forced to rely upon the food bank to feed their families. Despite this, the school board refuses to address these issues and applied for a lock-out. The first week of picketing included two picketers being struck by cars driven by administrators. The RCMP took no action about these events, instead focusing their efforts on escorting administrators and scabs across the picket lines. A return to the bargaining table in early October yielded no agreement. Not surprisingly, parents and students are siding with the strikers—joining them on the picket lines and making supportive social media posts. It will be interesting to see what effect this has on the next school board elections. The school board’s hard line is difficult to fathom. The district has been posting operating surpluses and has admitted it could afford to give raises. Bargaining to impasse in these conditions seems irrational. I would guess the district is picking up on the government’s messaging that public-sector wages must be frozen for two years. So the government is happy to raise private-sector wages to prevent workers from having to go to the food bank. But it’s somehow cool for public-sector workers to make so little that they have to use the food bank? That’s a pretty hypocritical position for the government to advance. It’s also a politically strange one, since the government will require public-sector votes if it expects to be re-elected. More importantly, it's a shameful way to run a school system. What would UCP labour policy entail? With a provincial election expected in the spring of 2019, it is useful to consider what labour policies Alberta’s United Conservative Party (UCP) might advance if they are elected. Analysis is made tricky because, (1) while the UCP passed policy at a convention (which should be binding on the party due to Jason Kenney’s grass-roots guarantee), (2) Kenney announced “he holds the pen” on policies after the convention passed some super embarrassing ones. To try and get a handle on what UCP labour policy might look like in practice I have canvassed Hansard and media statements, UCP policy statements, and social media postings. I’ll limit this post to changes to issues associated with the Employment Standards and Labour Relations Codes. It does not reduce poverty. Mr. Kenney: …What do you think a 50 per cent increase in the minimum wage results in? Well, according to the Bank of Canada 60,000 job losses across the country. According to the C.D. Howe Institute 25,000 job losses in Alberta. Think about how – oh, my goodness – when New Democrats get on their moral high horse and pretend they have a monopoly on compassion, and then because union bosses tell them to, they bring in a policy that, according to the think tanks will kill 25,000 jobs for immigrants and youth. Where is the compassion for those who lost their jobs, Mr. Speaker? There is none. There’s no regard. (2018.04.05, p. 433). The assertion that rising wages kill jobs seems to resonate with many Albertans. This may explain Kenney’s use of this narrative, despite there being limited and declining support for this position in the economics literature and good evidence that sectors that pay the minimum wage are experiencing growth in Alberta. The NDs do not appear to have indexed the minimum wage to inflation (gotta save something for the 2019 campaign!) so a UCP government could freeze the minimum wage simply by taking no action to increase it. Over time, inflation would erode its value. Whether a freeze would satisfy the business lobby and more right-wing UCP members is unclear. While Kenney may be coy on a reduction now, as we’ve seen with Doug Ford, once in office, seemingly anything goes. The Notley government has made a large number of minor changes to the Employment Standards Code. The UCP policy resolution promises a full and detailed review to ensure Alberta’s laws are comparable with other jurisdictions and make “workplaces safe and competitive”. Given that the recent changes to the Employment Standard Code were mostly about bringing it into line with other jurisdictions, I suspect such a review would identify few areas for change. It would be politically for the UCP to easier to just (further) lax enforcement of the law. It is likely that the UCP would roll back the application of many employment standards to Alberta’s farms and ranches. Agriculture industry associations have indicated they do not support a full rollback (although I imagine they could be talked into some rollbacks…), perhaps because this would jeopardize the funding base of their new safety association. "What we hear from Alberta farmers loud and clear, not professional lobbyists but regular hardworking people in agriculture, is that this bill is a massive cost driver for them it is unnecessary red tape." I suspect a significant rollback of farm-workers’ rights across all domains of labour policy would be in the cards. If done carefully, it should be possible for the UCP to prevent a successful constitutional challenge of such a rollback. prohibitions on unions assisting women to make pay equity complaints, and mandating onerous union financial disclosures. The UCP policy document specifically identifies eliminating the recent re-introduction of card-check certification processes and returning to mandatory votes. The evidence on this is unambiguous: giving employers time to interfere in workers’ decisions about whether or not they want union representation (via a mandatory vote) results in more employer interference, fewer certifications, and fewer union drives. Basically, it is an anti-union policy dressed up in the clothes of democracy and would almost certainly be implemented under the UCP. Kenney has also promised to scrap remedial certification power for the Labour Board revoked. At present, the Board can certify a union if the employer poisons the well through unfair labour practices. Under previous Conservative governments, the only remedy the Board could offer was another drink from the same well (which, of course, is no remedy at all). First contract arbitration would also likely hit the skids. The UCP policy document also proposes “giv[ing] individual members of labour organizations the right to determine whether or not their mandatory union dues are used to fund political activity and social advocacy.” The reason to pay attention to this proposal is that it is closely associated with the right-to-work movement, whereby union security clauses (which require every worker to pay union dues, because they benefit from a union contract) are profoundly limited or forbidden. Right to work laws were on the agenda at the UCPs policy convention and appear to be supported by the riding associations of sitting MLAs. These so-called “right-to-work” laws are an effort to undermine the financial security of the union (which, in turn, limits its ability to oppose the employer). They also divert union resources from fighting the employer to collecting dues. About half of US states have right to work laws. Research on their effect is mixed, with results often confounded by other factors. Overall, a UCP government is likely to make a concerted effort to tip the playing field back in favour of their corporate buddies. This is likely to have a negative effect on the wages and working conditions of Albertans, particularly low-wage Albertans. If I have time, I’ll have a gander at what Alberta might expect in terms of UCP policy on workplace injury prevention and compensation, immigration, and training as well as the tone of public-sector labour relations. Update October 15: Kenney recently indicated he would freeze the minimum wage, look at implementing a two-tier wage (based age),and rollback other labour law changes made by the NDs. So, pretty much what you'd expect.